Welcome to Kaupang - the vikingtown! Welcome to the excavation site for Norways first vikingtown! The Kaupang project people are hosts at Kaupang. 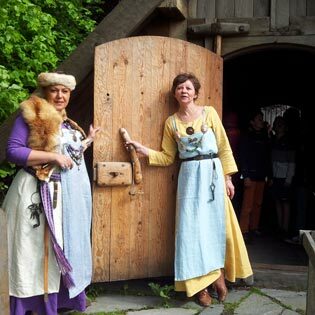 We offer guided tours and viking activities for young and old. Take part in the history of viking life and death in the town. Experience crafts, knowledge, religion and food culture. Every Tuesday, Friday and Saturday are museum and history days. we show you around in our history room, in the vikinghouse and outdoors. Get to know about how the town was buildt, the area Skiringsal around it, the crafts, life and death in vikingtime. We arrange archaeological excavations for the children to participate in. You an do the quiz trail and shoot with bow and arrow. We use longbows, as the vikings did. In the middle of the day, our freshly prepared and tasty vikings soup is served. You stew your own soup bread on the roof. This is a simple lunch for NOK 50. Every Thursday there are hiking and activities for slightly bigger children and adults. We walk the Viking road through the graveyard of Nordre Kaupang, towards the chief farm at Huseby, and see what we find there. Join! Afterwards there are shooting with bow and arrow and other activities on the slope. On Thursdays we also have Viking food and breadmaking on the roof. It is a tasty lunch for NOK 50. Every Saturday we go to town. We walk to the excavation area in the middle of the city and look into some of the craft that took place there. The calender shows at what time activitys is starting. Full speed or slow down: Visiters can choose to participate in activities or to relax and take it easy. Our hosts nevertheless make arrangements for our guests to have a comfortable visit. Detailed overview of what is going on which days in the summertime will soon appear here. For groups: By appointment we organize an experience day or a small party. We cater for groups up to about 100 people. We offer Viking food, made on site over open fire, as the Vikings did. 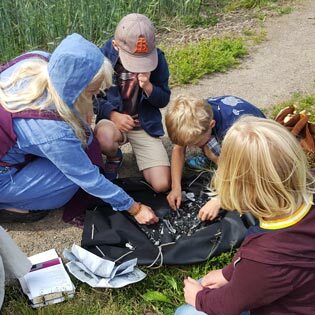 We arrange viking games that everyone can take part in, craft avtivities, and practical archaeological excavation for children. 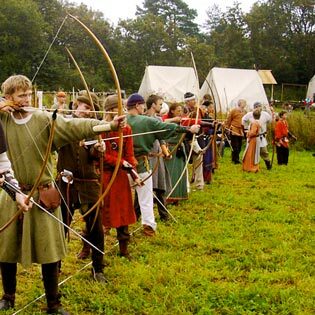 Our guests can try to shot with bow and arrow and participate in other physical viking competitions. We have historical board games and viking quiz, and you might meet the volva. Kaupang in Skiringssal was built around 800, and became an important trade and production city for Vikings and others. The location in the wedge of Viksfjord was significant when the city was established as a hub for trade and production. This page is updated August 27, 2018.